Don't Show Any Keen-Eyed Kids Movies That Reveal Secrets About You. SO ONE DAY MY NEPHEWS WERE WATCHING MOVIES FEATURING ME IN THEM. WELL, ONE KEEN-EYED PERSON SPOTTED OUT AND SAID, "WHY ARE THERE STRINGS ATTACHED TO YOUR BODY?" SO I ACCIDENTALLY SAID THAT SOMEONE WAS CONTROLLING MY ACTIONS WITH THEIR HANDS. 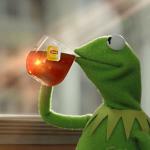 THAT SAME EXACT PERSON SAID, "SO YOU'RE A PUPPET?" I TRIED TO GET HIM OFF TOPIC, BUT IT FAILED BADLY. 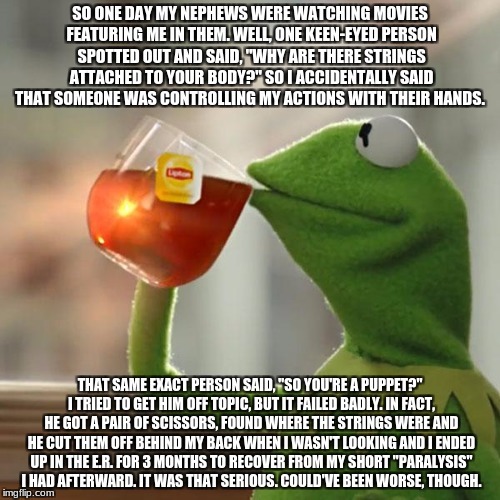 IN FACT, HE GOT A PAIR OF SCISSORS, FOUND WHERE THE STRINGS WERE AND HE CUT THEM OFF BEHIND MY BACK WHEN I WASN'T LOOKING AND I ENDED UP IN THE E.R. FOR 3 MONTHS TO RECOVER FROM MY SHORT "PARALYSIS" I HAD AFTERWARD. IT WAS THAT SERIOUS. COULD'VE BEEN WORSE, THOUGH.